Athletes and coaches from County Galway. Front row (from left) - Matthew Brennan (bocce); Aine McDermott (bowling); Katie Dillon (athletics); and Michelle O’Keane (kayaking). Back row (from left) - Michael Spelman (bowling coach); Evelyn Bohan (basketball coach), Simon Lowry (golf); Gina Naughton (basketball coach); Angela Griffin (gymnastics coach); and Colm Keane (medical co-ordinator) in attendance at the Special Olympics Ireland official launch of Team Ireland for the 2019 Word Summer Games at the Carlton Hotel Tyrrelstown in Dublin. Photo by Harry Murphy/Sportsfile. This March, five Galway athletes will travel to Abu Dhabi to compete in the 2019 Special Olympics World Summer Games. Part of a 91-strong Team Ireland squad, Matthew Brennan (35 ) from Ardrahan, Katie Dillon (27 ) Ballinasloe, Simon Lowry (27 ) from Loughrea, Aine McDermott (24 ) from Athenry, Michelle O’Keane (36 ) Galway city, and Emma Barrett (21 ) from Ennis, but who trains with Team South Galway in aquatics, will represent Ireland at the highest level of sporting competition for Special Olympics athletes. Taking place from March 14 to 21, Abu Dhabi 2019 will be the largest sporting and humanitarian event in the world this year. Supported by a volunteer management team of 39, Team Ireland will join 7,000 Special Olympics athletes from 170 countries at the games. Speaking at the launch, Team Ireland swimmer, Michelle O’Keane, aged 36, from Galway said: “We have been working towards this for a long time, some of us have been waiting for this moment since we started with Special Olympics. For some it has been years, but for everyone it has been hard work to get here. Ahead of the official launch, President Michael D Higgins sent a message of support to Team Ireland athletes. “Being chosen to represent your country on the international stage is a great honour indeed. It is a tribute, not only to your great talent as athletes, but also to your dedication, hard work and perseverance; qualities which make you inspirational role models and admirable ambassadors for Ireland. “I have no doubt that Ireland’s great reputation at the World Summer Games will be further enhanced by Team Ireland’s performance in Abu Dhabi, and that you will make us very proud indeed. Special Olympics Ireland is first and foremost a sports organisation and charity that supports children and adults with intellectual disabilities. 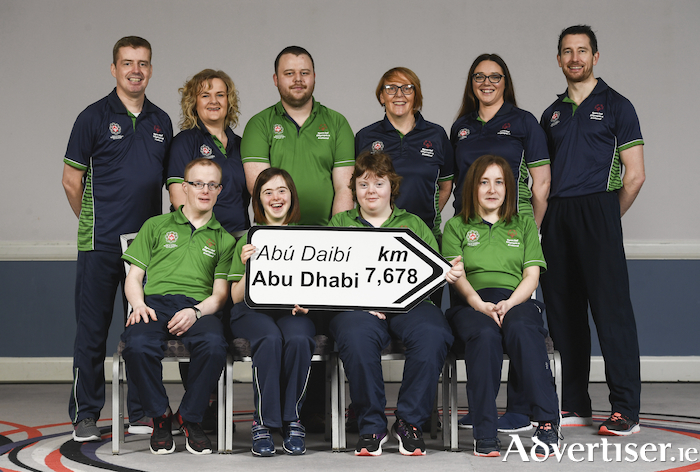 As the countdown to the World Games gets under way, Special Olympics Ireland is calling on the business community and individuals to help them raise much-needed funds to send the athletes to Abu Dhabi. To cover the cost of sending Team Ireland to the Games, Special Olympics needs to raise a total of €455,000 (€5,000 per athlete ). Page generated in 0.2106 seconds.